Hi and welcome to the March 2010 newsletter. It’s been a busy few weeks with exhibitions, visits, developments and trials. February has proven to be a busy month for our MD. Neil Fletcher has been in Australia supporting our company ECS Oceana, targeting new accounts. He has also attended and exhibition in Miami as well as joined our Export Sales Manager Tom Cropper in China. Here he attended a small exhibition in China as well as followed up with a number of our distributors. Tom has been working hard supporting our agent in India. 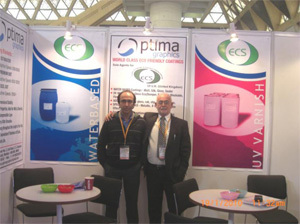 Having attended the Pamex 2010 exhibition with our partner they obtained many interesting leads and opportunities. I would like to take this opportunity to thank everyone for all the interest shown as well as thank our partner for the hospitality given to Tom. Big congratulations to our Technical Manager Ian Love and his wife Lucy on the birth of their baby daughter Rosie. We hope you enjoy the sleepless nights and very early mornings. Crazing, crazy paving or snake skin as it is sometimes referred to, is a problem which is highlighted when coating over heavy inked areas. Crazing is the cracking of the waterbased emulsion. This itself seems to be specific to the commercial sector of the market. Having spoken with a number of new and potential dealers both UK and worldwide the requirement for a suitable product is high. As such we have produced W480 Non Crazing DS Gloss Emulsion as a solution to their problem. It is formulated to provide high levels of gloss whilst maintaining its work and turn nature. Furthermore the product is ideal for high speed commercial presses (Heidelberg 105’s etc). Its soft and flexible film makes it the perfect solution for this problem. W480 has been produced and supplied for the last 3 months and has helped to secure new business for both ECS and its partners.